When Randy Johnson won his 300th game two years ago, staggering towards the finish line of a brilliant career, there was strong talk that the Big Unit might be baseball’s last 300-game winner, given the limitations and constraints (read that pitch counts) of the modern game. Not so fast. CC Sabathia already has 167 wins, and he won’t turn 31 until July 21. This is his 11th major league season, and through the first 10 the Yankee southpaw has averaged just under 16 wins a season. Sabathia is 167-92 for a .645 winning percentage. He’s led the American League in wins the past two years with 19 and 21 victories respectively. 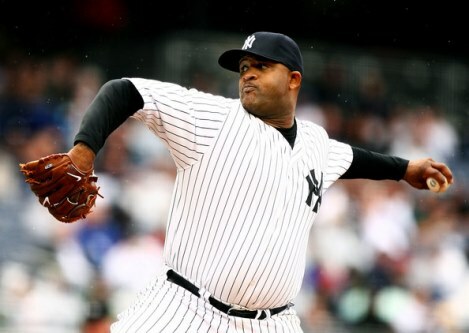 CC already has 10 wins this year, as many as anyone in the majors. He’s durable, having pitched at least 230 innings in every season since 2007. Never been seriously injured, hardly ever misses a turn, been on the DL just once in his career, that for a strained oblique early in the 2006 season with the Indians. No arm troubles. The very definition of a staff ace, a horse. Do the math. If Sabathia keeps on his current pace and pitches eight more seasons, he’d reach 300 wins somewhere around the age of 39. That would be younger than three of the four pitchers who won their 300th game since 2000 — Roger Clemens (40) in 2003 with the Yankees, Tom Glavine (41) with the Mets in 2007, and Johnson (45) with the Giants. Only Greg Maddux, who won his 300th at the age of 38 with the Cubs, would be younger. Maddux went on to win 355 games, eighth on the all-time list and one more than Clemens. Before that, Nolan Ryan in 1990 was the last pitcher to reach 300 wins, at age 43, with the Rangers. Only four active pitchers have more wins than Sabathia — Tim Wakefield (197), Roy Halladay (179), Tim Hudson (171) and Livan Hernandez (171). Halladay is the youngest of this group at age 34, Wakefield the oldest at 44. Only 24 pitchers have won 300 games, and of that group only six — Warren Spahn, Steve Carlton, Eddie Plank, Glavine, Johnson and Lefty Grove — are left-handers. CC Sabathia has a long ways to go, but he has a legitimate shot at becoming the 25th pitcher in baseball history to reach 300 wins. Here’s my ballot for the 2011 All-Star Game. Vote for your favorites at mlb.com. If you think you know everything there is to know about Mickey Mantle, well think again — that is unless you’ve read “The Last Boy,” Jane Leavy’s comprehensive biography of the great Yankee slugger, the magnificent Number Seven. Leavy shows us a side of Mantle we’ve never seen before, a great ballplayer and magnificent teammate but also a flawed man with a fractured family life and a problems with alcohol that eventually led to his death in 1995. In addition to her own personal experiences, Leavy spoke with more than 500 people — friends, teammates, girlfriends, writers and others — to get a clear picture of The Mick. And the biography chronicles the changes in Mantle’s personality from his years patrolling center field in Yankee Stadium to life after baseball. “The transformation of The Mick over the course of eighteen years in the majors and forty-four years in the public eye parallels the transformation of American culture from willful innocence to knowing cynicism,” Leavy writes. “The Last Boy” charts some of Mantle’s tape measure home runs, starting with the ones he hit in spring training his rookie year, 1951. at the University of Southern California. O ne of those home runs cleared the fence at the 439-foot sign and landed in the middle of the football field beyond, where it bounced into the huddle of the practicing Trojans and hit Frank Gifford in the foot. To the day he died, Rod Dedeaux, legendary USC baseball coach, swore he saw Mantle hit two 500-foot home runs that day, one from each side of the plate. Leavy chased down Donald Dunaway, who caught up to Mantle’s legendary 565-foot home run hit out of Washington’s Griffith Stadium in 1953. Mantle was well known for his incredible pain threshold. and teammates and trainers marvelled at his ability to play ball every day. “Mickey Mantle has a greater capacity to withstand pain than any man I’ve ever seen. Some doctors have seen x-rays of his legs and won’t believe they are the legs of an athlete still active,” Yankee trainer Joe Soares said in 1968, The Mick’s final season. In “The Last Boy” we learn that Mantle took in homeless teammates like strays, was always good for a loan, and picked up every tab. But he was often surly with the media. “In the last years of his life, Mantle morphed into an avatar of the confessional Nineties,” says Leavy. The Mick confronted his alcoholism, but it was too late, and shortly after a liver transplant he died in 1995, just 63 years old. Thanks to Jane Leavy — who also authored “Sandy Koufax” — we now know the full, inside story of Mickey Mantle. 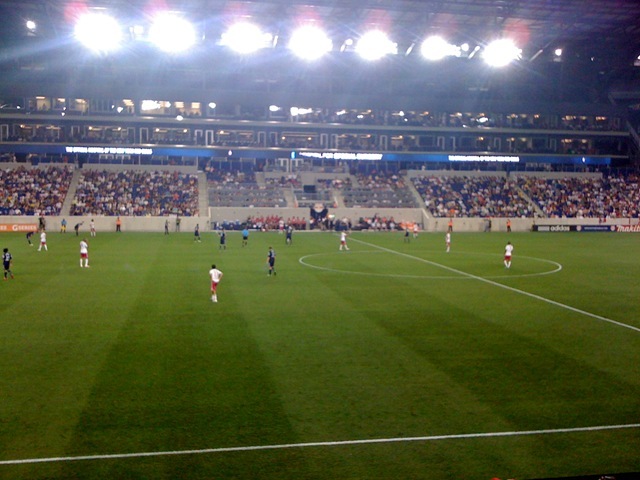 Saw my first professional soccer game in three decades or so the other night — New York Red Bulls vs. New England Revolution at the new Red Bull Arena in Harrison, NJ, outside of Newark. The Red Bulls won soccer’s version of the New York-Boston rivalry, 2-1, on a goal by Thierry Henry. An offside call nullified a New England goal in the waning moments of the match. That was the MLS — Major League Soccer. Before that, my last pro soccer match was in the early 80s — the Fort Lauderdale Strikers vs. the Tampa Bay Rowdies in a NASL (North American Soccer League) match at Lockhart Stadium in Fort Lauderdale. In those days of the Reagan regime, the Strikers were the only pro show in South Florida outside of the Miami Dolphins. No Marlins, No Panthers, No Heat. The Strikers played in NASL back then. And they still play in the NASL today. But it’s a different NASL, no longer the premier soccer league in America. NASL was big time in 1980, when the Strikers advanced all the way to the finals before losing to the great Pele and his New York Cosmos. Between 1977 and 1983, before moving to Minnesota, the Strikers had some world-class players. The legendary party boy Georgie Best played for those Strikers. So did midfielder Ray Hudson, Peruvian legend Teofilo Cubillas, and German center Gerd Muller, also known for his tennis exploits in Plantation. The goalkeepers included Gordon Banks, the top keeper in the league his first year despite being blind in one eye, and the poetically named Jan van Beveren, the Van Lingle Mungo of soccer. Three other versions of Strikers have called Fort Lauderdale home — representing the ASL, USISL and currently the NASL again. The “heat” is on Miami’s LeBron James following his Game 4 flame-out. When LeBron James pulled his disappearing act against the Dallas Mavs in Game 4 of the NBA Finals the other night, he evoked memories of another classic underachiever — Wilt Chamberlain. LBJ is considered by many to be the best player in the NBA today. He’s been compared to some of the all-time greats, including his Airness himself, Michael Jordan. But in these NBA Finals, LeBron is not even the best player on the Miami Heat. Dwayne Wade, pure and simple, has been Miami’s best player and their go-to-guy down the stretch. King James scored eight points in Game 4. Eight points. Are you serious? You have to go back 434 games to find the last time the great Lebron scored eight points or less in a game. LeBron made just three of 11 shots and came up empty when it mattered most, down the stretch in the fourth quarter. James did finish with had nine rebounds and seven assists. But all that really matters is that the Heat got eight points from the most dominant basketball force on the planet and lost by three with a chance to put a stranglehold on the series. Sounds like Wilt Chamberlain, the Big Dipper. Wilt was a virtually unstoppable force who once averaged 50 points for an entire season and scored 100 points in a single game. For years in the 60s, Wilt’s teams — the Philadelphia Warriors and later the 76ers — came up short against the Boston Celtics in the Eastern Conference playoffs before the Sixers won the NBA title in 1967. The following year, Philly blew a 3-1 lead and lost to the Celtics in a seventh game where Wilt, far right against Bill Russell, scored only 14 points and failed to score a single point in the second half. Wilt was traded to the Lakers in the off-season, and took LA to the NBA Finals. But in Game 7 of the 1968 Finals, Chamberlain took himself out of the game midway through the fourth quarter, never returned, and the Lakers lost to the Celtics. In 1970, it happened again. Lakers-Knicks in the NBA Finals, Game 5, and New York’s Willis Reed went down in the first quarter with a thigh injury. The Lakers led by 13 at the half, but collapsed in the second half when Wilt and Jerry West combined for just five shots. Wilt had a monster Game 6 with 45 points and 27 rebounds as the Lakers forced a seventh game. But facing a hobbled Reed in Game 7, Chamberlain was barely visible as the Knicks romped to their first NBA Championship. Wilt did manage to win a second NBA title in 1972 when Reed was once again sidelined by injury. In Chamberlain’s defense, he faced Hall of Fame centers like Russell, Reed, Nate Thurmond and Kareem Abdul-Jabbar, and led far inferior teams to near titles. LeBron, who is seeking his first NBA Championship, has an edge in talent in these finals. The Heat were heavily favored coming in, and hold the homecourt advantage over Dallas. “I’ll come back in Game 5 and do things that need to be done to help our team win,” LBJ said after the Game 4 meltdown.